Decorating your Christmas tree with the same old dusty baubles this year? Why not add colour to your decorations with Pantone Universe Christmas Baubles? Created by Italian design house Seletti, Pantone Christmas Baubles are sure to delight and amuse anyone with a background in colour or design, and bafflement in anyone else! 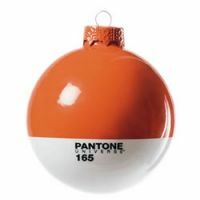 Each bauble features one of ten Pantone official colours and reference code.